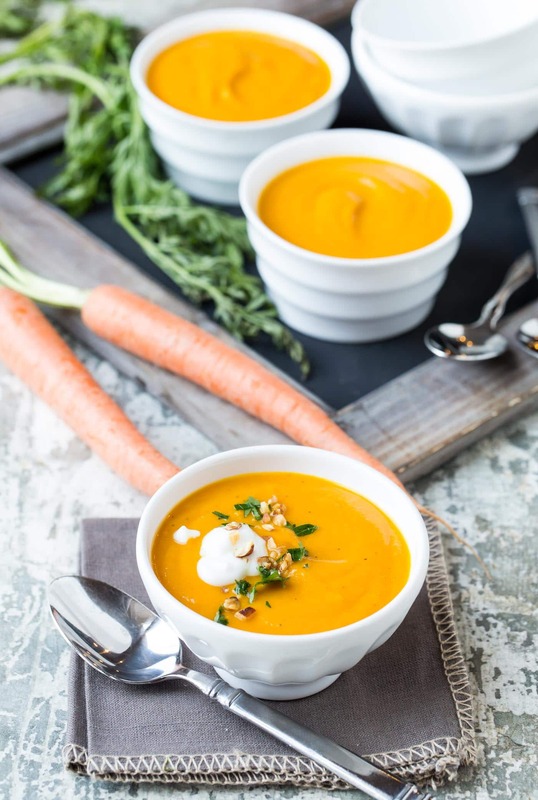 Welcome spring in a flavorful way with a generous bowl of this Carrot Ginger Soup! A few years ago I had lunch with my mom on one of the first nice days of spring. We were lucky enough to score a table outside on a bright, sunny day, and I gobbled my way through a version of this Carrot Ginger Soup. Now I don’t know if it was the gorgeous weather, the lovely company or the amazing meal, but the memory of that soup left a lasting impression on me. Lucky for me (and you! ), I recreated the recipe at home, and now this craveable Carrot Ginger Soup can be enjoyed rain or shine all year long. 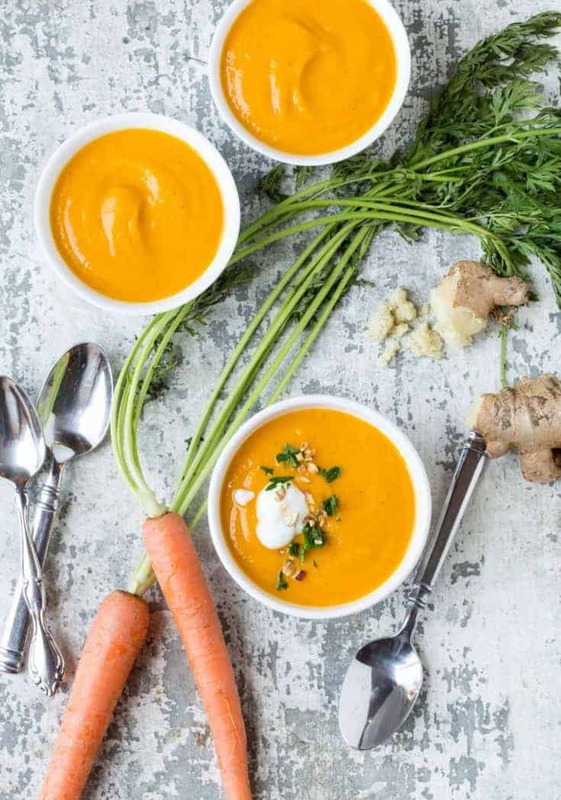 With just a handful of ingredients, this Carrot Ginger Soup recipe comes together with minimal effort. Love that! Chunks of sweet carrots and savory onions are sautéed with nuggets of sweet potatoes, garlic and a hefty dose of fresh ginger. Stir in some vegetable broth, salt, pepper and cumin, simmer for 30 minutes, and then puree the soup until it’s silky smooth. The texture is light and velvety but still substantial. You can garnish this soup with just about anything. A dollop of plain Greek yogurt, fresh parsley or cilantro, chopped nuts or a sprinkle of cumin are all great options. Get creative! If you’re looking to get out of your salad rut, this Carrot Ginger Soup makes an excellent first course in lieu of the usual greens. It would also be super cute in little shot glasses on an appetizer buffet. Me? I didn’t wait for a party or special occasion; it was my lunch all last week! Tip: Short on time? Grab a tube of pre-minced ginger in the produce section and add to the soup just like you would freshly grated ginger. I always have tubes of ginger and garlic in my fridge. Helps me avoid last minute trips to the grocery store! Heat a dutch oven over medium heat. Add oil, onion, carrots and sweet potatoes and gently saute for 5-10 minutes or until onion is translucent but not browned. Stir in garlic and ginger and saute for 1 minute. Pour in vegetable broth and stir in salt, pepper and cumin. Reduce heat to medium low, cover and simmer for 35-45 minutes or until carrots and sweet potatoes are fork tender. Transfer mixture to blender in batches and puree. Taste for seasoning and adjust to your preference. You can also use an immersion blender or food mill to puree the soup. If using a regular blender, be careful to only fill the blender jar half full of hot liquid and secure the lid with a dish towel before blending. I wonder how the Carrot Ginger soup would be substituting the vegetable broth for low sodium chicken broth? I don’t care for the name brand vegetable broths sold in the grocery stores in my area. Any thoughts? Hi Debbie, I wouldn’t hesitate to substitute chicken broth. The veggie, ginger and spice flavors will still shine through. Enjoy! Better than broth makes the absolute best broth for veg. Soups. can you send us the nutritional information for this soup? Hi Marty, Since brands and ingredients can vary, we choose not to provide nutritional information for our posts. That said, there are a variety of online nutritional calculators where you can easily input the ingredients to find the information you’re looking for. Here’s one to get you started: http://recipes.sparkpeople.com/recipe-calculator.asp. Hope that is helpful! What a beautiful, healthy soup for the fall. I am adding this to my list of soups to make! Fabulous combination of carrots and sweet potatoes…the ginger really sets it off! Glad to hear you enjoyed it, Bonnie. Thanks for the comment! Thanks, Phoebe! There’s nothing like warm soup to take the edge off of chilly fall day. No changes on this recipe. It is perfect. Thanks so very much for the delicious and beautiful food. You are welcome, Nancy. Thanks for being a loyal reader! Trader Joe’s Carrot Ginger soup in a Tetra Pak is excellent chilled — like Vichysoisses. Worth a try. A staple at opur house for lunches on the deck (along with cold smoked salmon). What other garnishes would be good for this soup? I’m making it in my foods and nutrition class and don’t know what to add for the garnish. Thanks! Hi Cali, you can garnish with any variety of chopped herbs – parsley, chives, cilantro – or even swirl a bit of plain Greek yogurt on top. If you want something crunchy, try a few mini croutons. Enjoy! I just made this for dinner. I’m on day 5 of whole 30 and have a feeling I’ll be making a big batch of this deliciousness for the remaining weeks! Subbed bone broth for the chicken broth and still great, even my picky three year old gobbled it up! Thanks. So glad that you enjoyed it. Thanks for stopping back to let us know! Hi there, can you please tell me what you used for garnish in your beautiful pictures? Thank you in advance! Hi Kara, we used some Greek yogurt, chopped nuts and a little bit of cilantro but feel free to use whatever works for you. Enjoy! This recipe was great! I decided last minute to add some whole fat coconut milk to make it extra creamy, but it was really good both ways. Best recipe I have found on pinterest in a while. So glad you enjoyed it, Ash! And I love the coconut milk twist you took with it. Yum!